As per the order issued by National Green Tribunal, driving to or beyond Rohtang Pass requires a permit from the SDM Office in Manali. Until last year, if you wanted to travel to Rohtang Pass for sightseeing, you could apply for the permit online. However, if you wanted to travel beyond Rohtang and explore Ladakh, Lahaul, Spiti or Pangi, you had to procure the permit from the SDM Office in Manali. This was a regressive policy, since the permit for up to Rohtang Pass were issued only to Himachal Vehicles (mostly Manali taxis) and was limited to certain amount of vehicles per day (400 diesel and 800 petrol vehicles this year). 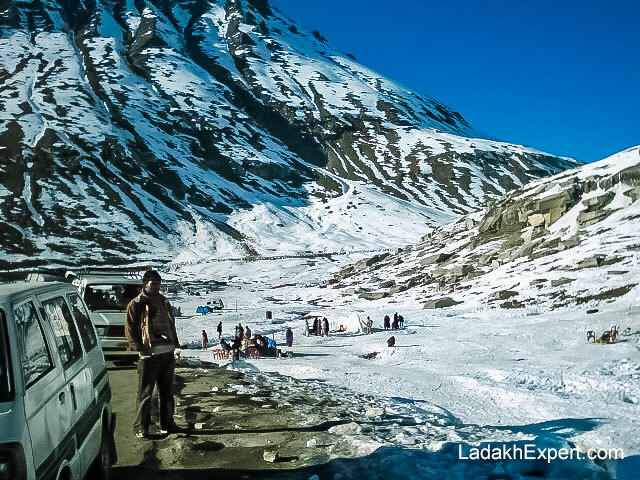 Travelers heading to Ladakh and other places beyond Rohtang had to either get the permit made in advance through a travel agent or spend precious time getting the permit made in Manali. This year though, this would no longer be the case. With the ease of getting the permit made online, travelers can plan their trips without having to allocate time for permit procurement process in Manali and can start off early in the morning to reach their destination comfortably and without getting stuck in traffic snarls. A word of caution for those who own a vehicle which is 10 years or older, you won’t be allowed to cross Rohtang from the Manali side, due to NGT guidelines. You can however, cross from the other side i.e. you can cross Rohtang when you’re coming back from Leh. BRO has started work to clear the snowbound Manali – Leh Highway of snow, in order to reopen it for 2017. Thanks to heavier than usual snowfall in Himachal Pradesh and Ladakh, work to clear the Manali – Leh Highway of snow had been delayed by 20 days. Normally this snow clearing operation begins by 1st of March. So far, BRO has managed to clear the road from Manali to Gulaba and from Sissu to Darcha. In the next phase, BRO would be attempting to clear the road from Gulaba to Marhi and from Koksar to Sissu. While work to clear Baralacha La from Leh side would begin a little later on. This year, Manali – Leh Highway s expected to open a little late, though hopefully, it should reopen by the first week of June, if the weather remains clear.